Today was full of sights, events and people. We traveled by bus several hours to visit two villages outside of Chimaltenango, El Cojobal and Comalapa . It was a day full of extremes: happiness and complete sadness. I saw the poverty these hard working industrious people have to fight every moment of their lives. It took us two hours to get to the meeting in the morning. We took a bus, walked 45 minutes up along a mountain ridge and then tromped through a maze of cornfields, farm land and dirt paths. Even though we were 45 minutes late, the women were delighted to see us. 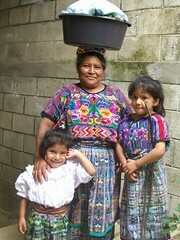 No gringos had ever come to visit them in their homes and asked questions about their daily lives. They were all very welcoming and excited to talk with us and have their photos taken. They were also glad to see us because the head of the Chimaltenango office of Friendship Bridge brought the checks for their next 6-month loan. The women were quite happy with this day. The atmosphere was charged with good vibes. 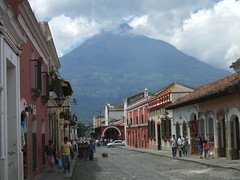 We left Chimaltenango around 9:00 and rode the side road to Antiqua Guatemala, the original capital of the country. In Parramos we were going to go to breakfast at a famous fancy restaurant but we got sidetracked in the center of town and ended up eating at the corner eatery and talking to the owner Manuel for an hour or two. All the while his wife worked the dozen customers that came and went while we just talked away. Occasional he would get up and tell her there was another customer. But he was explaining to us about the differences in the 23 languages spoken here in Guatemala. This morning we woke up at 4am to catch a microbus from Nebaj, Quiche, Guatemala to interview a group of women in San Francisco Javier. 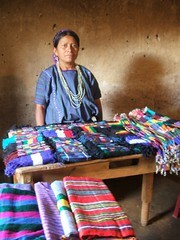 The reason for the interview is to write the story of their business and lives in order to help obtain microloans on Kiva.org for Friendship Bridge in Guatemala. The rain was pouring as we made our way through the deep puddles of the dark streets. Only a few people were out at this time of the morning, walking in the rain underneath thin plastic sheets and clogging along in the total rubber boots so many of the campesinos wear in the fields. A few men hid in the shadows trying to stay dry or sobering up from the night's celebration. This week is the town's annual festival for its patron saint. We got on the bus a little after 5am. It plowed out of town and followed a rough dirt road for about an hour. The darkness was made more intense by the low clouds that surround this incredible volcanic landscape. The morning light seeped though the misty morning. Clouds obscured most of the surrounding mountains but we got an occasional glimpse of the top of a-not-so distant volcano. The women we visited Tuesday in La Estancia de la Cruz have been working in the fields all their lives and they know no other way to make a living. As young children they did not go to school because they needed to help the family in the fields. The land here is very rich because the volcanic soil and the 6 months of rain. None of the women we met with today own their own land. They rent a plot and also work for someone else. 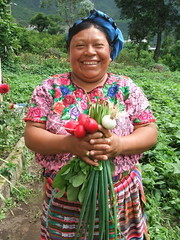 With the help from Friendship Bridge, the women are able to rent a 40'x40' plot and grow their own flowers and vegetables. They have a chance to dream and maybe educate their children if there is enough money to buy shoes, paper, pencils and needed supplies. Currently some families do not send their children to school either because they need the help in the field or they just do not have the money to send the children to school. The month of July is known as the hunger time because the food they had stocked piles are nearly depleted The growing season is February to August and they corn is not ready to harvest. Wednesday I headed up to San Antonio, Solola, Guatemala. It was the second day of volunteer work for Friendship Bridge and Kiva.org. My job was to interview four women and write about them and take photos which will be posted on the Kiva site so that people in the rich part of the world can make small loans to them via the Internet. Patti (the Friendship facilitator) and I hopped into the taxi (really the back of a pickup). We snaked our way along the shore and up the side of a mountain -- the view was incredible. As I looked across the emerald lake toward the towering volcanoes, I wondered how such a beautiful place could house such incredible poverty. All day I sat with the Mayan women in their homes, business and community center learning about their struggles, victories and dreams. These people had been living in a war-torn area for twenty years only to be further pummeled by the incredible natural disaster Hurricane Stan in 2005. The torrential rains as a result of the hurricane washed away many communities. Whole neighborhoods no longer exist because of the mudslides that swallowed up the land the neighborhood sat on and with it thousands of people. It threw these people further into grave poverty. Leaving Mexico and entering Guatemala. It was our last day in Mexico. We had spent a lovely afternoon swimming in the aqua colored water of this very quaint lake in the lowlands of Chiapas, Mexico. We set up our tent not ten feet from the waters edge and cooked our beans and ramen noodles. As I fell asleep with the sounds of the jungle all around, I thought about what the next day would bring. 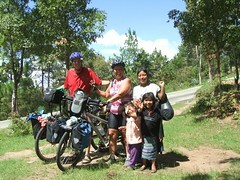 We where going to enter into Guatemala, our first country in Central America. I had heard so many different stories about this country, I did not know what to expect. Would the border crossing be dangerous, with hordes of kids overwhelming us and perhaps slashing our pannier? Would the border immigration officials try to charge us horrendous fees? Would the money changers rip us off? 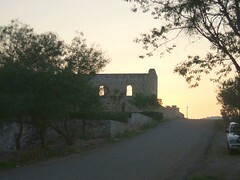 As we rode the hot flat road toward the border, my stomach had a twisted knot and my head hurt. What would happen to us? We started our day unusually early, the alarm clock rang at five in the morning. 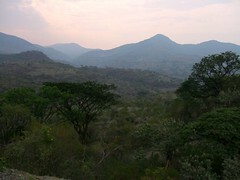 We were facing steep climbs in the southern mountains of Mexico in the state of Oaxaca state of Mexico. The total elevation would be determined on how far we could ride which was determined by varying factors. 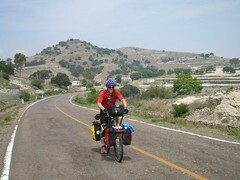 The steep grades with our heavy loads would test our muscle endurance, the amount of time on a saddle would test our butts, the heat of the day in southern Mexico in May would bear down on our helmet-covered heads cooking us under the afternoon sun. Would we be hit by a late afternoon torrential rain, and if this happened would we be a place with cover? All these thoughts raddled around my brain as I mounted my bike and started the days adventure. The early morning is a great time to ride because of the muted morning colors that fill the surrounding landscape, This morning was especially wonderful because the red-colored soil that stretched all around us was lit up doubly with the rising morning sun. A mist hung above the rich farm lands as we rode the quite river valley road. This moment of bliss was interrupted as the awakening sun heating the morning mist and us with it. At 10 miles out we stopped for breakfast of quesadillas and sandwiches called tortas. As we waited for breakfast, I adjusted my seat for today’s ride. Yesterday's ride of 4500 feet climb stressed my soft tissue so an adjustment was called for. We rode almost all day along a ridge line, deep valleys to the left and massive valleys to the right. We would climb 500 feet and descend 400 feet, and repeat this over and over. Climbing and descending. All and all we climbed over 3600 feet for the days total. I was in awe, how a road can be built along a ridge for 40 miles and have view on the left and right. It was an incredible bike ride with the beautiful vistas of tropical Oaxacan plants scattered throughout the expansive terracotta-colored landscape, but at the same time it is the dry season, and the land waits patiently for the rain to come in earnest. As I rode the long miles, I kept myself entertained by looking around at the sights which are so foreign to me yet spike my curiosity. Who lives in the Adobe brick houses with tin roofs which stood on every distant hill top? What was life like for lone Mixtec Indian who worked hunched over his plot of land, and woman hunched over the concrete basins washing the endless piles of clothes, or preparing the days food? Why was the goats and mules making those awful sounds of protest? I let my mind wander for most of the time except when traffic approached or the road side DOG gave chase to me in which I focus on patterns of approach and the need for evasive action. Cars are mostly predictable, but not always. If I see a single car, it can go around me. If there are a bunch of big vehicles such as buses or large trucks, I avoid them and get off the road.